Caldesmon (CALD1) belongs to the caldesmon family and is an actin- and myosin-binding protein implicated in the regulation of actomyosin interactions in smooth muscle and nonmuscle cells (could act as a bridge between myosin and actin filaments). CALD1 stimulates actin binding of tropomyosin which increases the stabilization of actin filament structure. In muscle tissues, CALD1 inhibits the actomyosin ATPase by binding to F-actin. This inhibition is attenuated by calcium-calmodulin and is potentiated by tropomyosin. 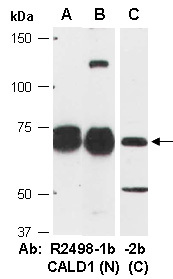 Rabbit polyclonal antibodies were produced by immunizing animals with a GST-fusion protein containing the N-terminal region of human CALD1. Antibodies were purified by affinity purification using immunogen. recognize the 70 kD isoform of CALD1.